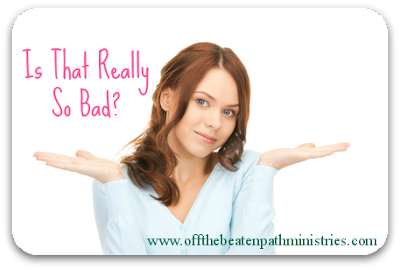 Off the Beaten Path: Anxiety - Is That Really So Bad? Anxiety - Is That Really So Bad? Yes, my chest feels a little heavy lately. I know. That's not a good thing. I'm making an appointment with my doctor today for later this week, but meanwhile there's something else I know I need to do. I need to quit worrying. I need to stop being so anxious. You too? In fact, nearly 40 million Americans are being treated for anxiety and its physical symptoms today. Actually, a staggering 23 million women struggle with anxiety disorders, while only 14 million men report similar issues. Whether more women are treated for these issues because they are more forthcoming about their problems or are actually more stressed is for someone else to figure out. But suffice it to say, we women are struggling with Jesus' directive to "not be anxious" in Luke 12:29. But, hey, what's the harm, right? Is a little anxiety really so bad? First of all, anxiety feels like a constant dose of adrenaline, the kind that is indicative of a "flight or fight" instinct. It's a restlessness, a nervous energy, an uptightness. There are several levels of anxiety ranging from feeling a little nervous about an appointment to constantly worrying about the coming days to shutting down. If you're at the far end of that range, where you can't seem to turn the negative, worrisome thoughts off even for sleep, you may need to seek medical help. But even those of us who are simply fretting, restless, and a little agitated need to consider how we can put this endless cycle of worry to a stop. Sometimes I feel like Jesus' mandate to "not be anxious" is an unfair request. Easy for Him to say, right? He may have been tempted, but, hey, He's God. I'm not. But the truth is, when I'm anxious about things out of my control, the crux of the problem may just be that I'm actually trying to be God. And failing, of course. A friend recently shared with me some advice she had received from a wise woman. The woman had encouraged my friend to, "Acknowledge the things you can control and know the things you can't control. Make a list if you need to. Now, do the things you can do about that which you can control, and leave the other things alone." The woman went on to tell my friend that we lose all feelings of power when we focus on the things we can't control. By focusing on and mulling over (and over and over and over) the things we can't control, we actually paralyze ourselves into thinking that "all of life is out of my control! I'm helpless! I'm a victim! Ugh!" On the other hand, when we focus on the things we can and should control (even little things like hygiene, spending, recreation, simple choices, etc.) we regain a sense of power. And when we actually do have the opportunity to do something about those looming fears, we're prepared and empowered to do it rather than stuck feeling inadequate or helpless. Make sense? It does to me. So how do you stop anxiety in its tracks? I'm no psychiatrist or medical doctor. I realize a woman's anxiety may reach the levels where she needs counseling or even medication. I totally get there. Hey, I may be there. But I also know what the Bible teaches us about how to handle our concerns and cares so we don't reach that level to begin with. Psalm 38:18 reminds us to resist the temptation to hide our sin from God. In fact, in Psalm 32:3 we learn that the psalmist's bones ached because of his hidden sin. Confess your sins to your gracious and good God. You may find that much of your anxiety disappears. Focus on the present, not the future. Matthew 6:34 reminds us that each day has enough to handle in it without borrowing future troubles. Plus, remember the "wise woman" I mentioned earlier asserted that handling today's issues will empower us to better handle what comes tomorrow. Get your priorities straight. Are you sweating the small stuff? Luke 12:21-23 reminds us that life is more than just all the little concerns of the day. Seek God's bigger purposes for your life and focus on what He's doing there. Pray with thanksgiving. Now that one sounds impossible. But could we make it a matter of discipline to refuse to mull over our worries and instead verbally, audibly thank God for whatever He's up to in our lives? Anxiety is no small matter. Not only can it potentially rob us of our joy and steal away our health, but it also diminishes our testimony greatly. When we exhibit signs of anxiety to those around us, we testify that "God is not able, so I have to think on this." We indicate that He is not trustworthy, good, gracious, aware, or caring. And that's just what the enemy wants us to do. Yeah, anxiety really is that bad. What do you do to keep anxiety at bay? Do you think being anxious is a sin or just a bothersome habit? Labels: anxiety, Is That Really So Bad?